The Java Arrays.equals Method is one of the Java Array Method which is used to check whether user specified arrays are equal or not, and if they are equal it return Boolean TRUE otherwise FALSE. In this article we will show you, How to compare the Arrays using Java Array equals method with example. 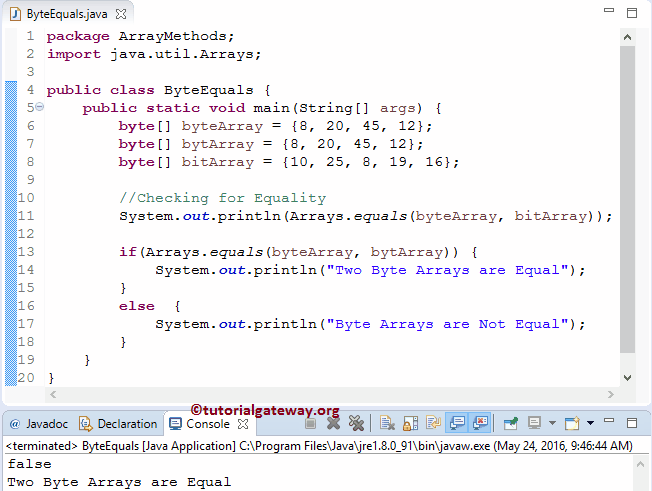 Before we get into the example, the basic syntax of the Arrays.equals in Java Programming language is as shown below. The Java Programming Language provides nine different Java array equals methods to compare the user specified Java Arrays. In this Java program we declared three byte arrays with random array elements. Next, we will call the public static boolean equals (byte b1, byte b2) method to check whether they are equal or not. Next, we used the Java Arrays.equals method to check whether the above specified byte arrays (byteArray, bitArray) are equal or not. Next, we used the Java If Else Statement to check whether the above specified byte arrays (byteArray, bitArray) are equal or not. In this Array equals program we declared three boolean arrays with random array elements, and then we will call the public static boolean equals (boolean a1, boolean a2) method to check whether they are equal or not. In this array equals program we declared three short arrays with random array elements, and then we will call the public static boolean equals (short s1, short s2) method to check whether they are equal or not. In this Java program we declared three integer arrays with random array elements, and then we will call the public static boolean equals (int i1, int i2) method to check whether they are equal or not. In this Java program we declared three long arrays with random array elements, and then we will call the public static boolean equals (long l1, long l2) method to check whether they are equal or not. In this Java program we declared three double arrays with random array elements, and then we will call the public static boolean equals (double d1, double d2) method to check whether they are equal or not. In this Java program we declared three float arrays with random array elements, and then we will call the public static boolean equals (float f1, float f2) method to check whether they are equal or not. In this Java program we declared three character arrays with random array elements, and then we will call the public static boolean equals (char c1, char c2) method to check whether they are equal or not. In this Java program we declared three string arrays with random array elements, and then we will call the public static boolean equals (Object Obj1, Object Obj2) method to check whether they are equal or not.